On a night when the brilliant Russian pianist Daniil Trifonov was playing at the Usher Hall as part of the Edinburgh Festival, it was not to be expected that any piano fans would still be available to come to the Edinburgh Book Festival to hear my talk, which clashed directly with the Usher Hall concert. Fearing disappointment, I deliberately stayed out of the way in the Authors’ Yurt before my talk, and didn’t venture out to see how many people were in the queue. So it wasn’t until my interviewer Sheena McDonald swished back the curtain as we entered the Studio Theatre that I saw hundreds of friendly-looking people sitting in the audience. What a nice surprise! I even quite enjoyed playing several little pieces on a digital piano to punctuate the talk. And, as Sheena had predicted, there were plenty of intelligent questions from the audience when we got to the Q&A. The questions continued as I sat signing books in the Signing Tent afterwards. Altogether a good experience. 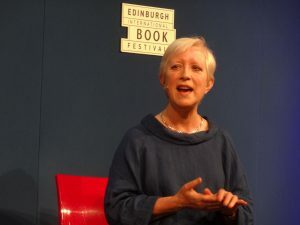 Thank you, Edinburgh Book Festival audience! This entry was posted on Thursday 18th August 2016 at 11:46am	and is filed under Books, Concerts. You can leave a response, or trackback from your own site. Oh bravo for such discerning audiences! A very feel-good read! Thanks for posting. So — when a pianist gives a talk, do people in the audience still cough?